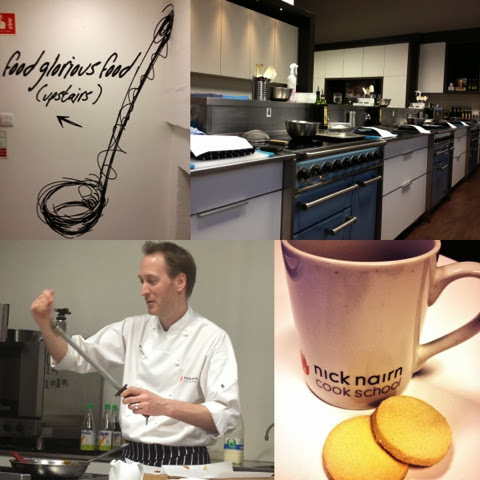 I got an early Christmas present last week from none other than Nick Nairn. 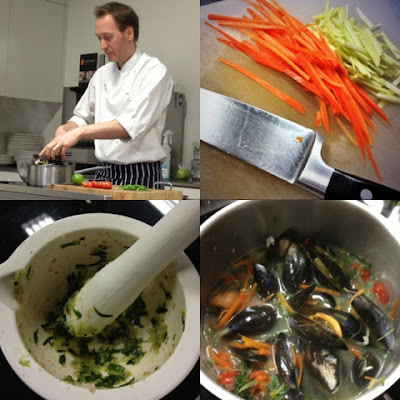 The opportunity to try out what a £149 one day cooking class gift card gets you at his Aberdeen Cook School. With cash gift cards starting at £20 and class gift cards ranging in price from £49 to £249. I'm sure anyone who finds Nick in their stocking this Christmas will be very happy. I know only too well the pleasure of receiving such a gift card as my Mum and Dad gave me a Quick Cook card last Christmas. Its 12 month validity meant that I could take my time and choose which class and date worked best for me. I used it at the end of October to attend Saffron Chicken & Chorizo. This was my second quick cook class. The first having been Perfect Sole Supper. My tutor on the day was Barry but Mr Nairn himself was also in the building and couldn't resist coming downstairs for a nosey at what we were making. He was more than happy to pose for photos with participants and sign books. Even if you aren't attending one of his tutored classes you may well bump into him as he's up in Aberdeen at least a couple of days a week. The quick cook classes take place downstairs next to the shop in a galley style kitchen with a dining bar on one side. 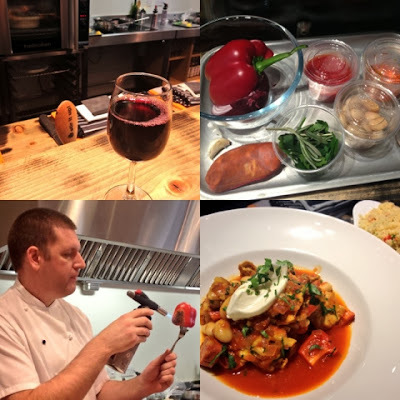 It's a very social atmosphere with the chance to learn, cook and enjoy a glass of wine over a couple of hours. Equally suited to coming with friends or on your own. The perfect opportunity to eat and learn at the same time. 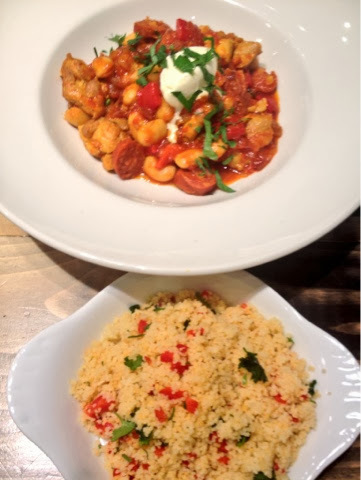 I really loved the Saffron Chicken & Chorizo dish that we made. So much so that its gone onto my Christmas week menu. I picked up lots of tips along the way including soaking the saffron in water, peeling the first layer of onion off as well as the skin, Holding the pepper in the blue bit of the flame as that's where its hottest and not being nosey and leaving the chicken to cook without constantly poking it. With a 9.30am start on a Sunday we needed the coffee and shortbread to wake us all up. 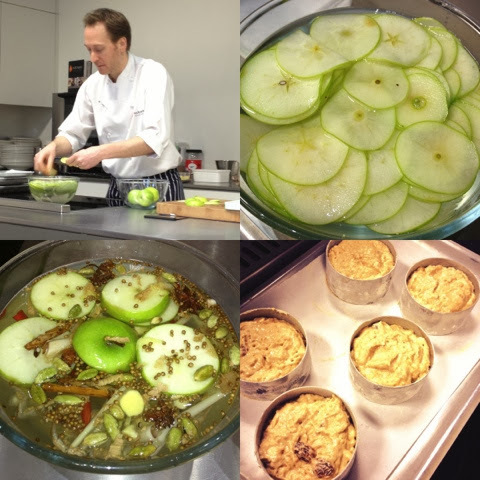 After an introduction to the kitchen and a demo how to make apple chips in stock syrup we were let loose to make our own Apple Sauce Cakes. Yet again plenty of top tips along the way. For me this is possibly the best thing about the classes, all the wee nuggets of info that you pick up along the way and can incorporate into all of your cooking. In making the sponge I learned why when combining ingredients you can sometimes end up with a curdled looking mess which Tristan described delightfully as "cat sick". 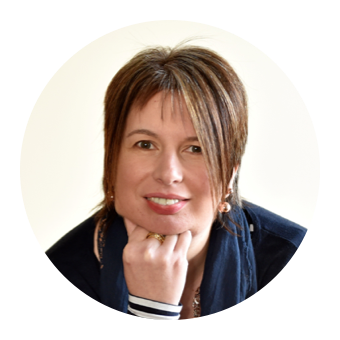 The problem is that the ingredients are too cold and the solution is to warm them up beforehand and prevent or cure by sitting the mixing bowl on a damp warm cloth or in a sink of warm water. With our apple sauce cakes cooked and set aside we began work on our starter. First up prepping the mussels. I've always removed barnacles and any of the scaly white bits. However Tristan informed us that they are worm casts and no need to worry about scraping them off as they won't become detached in the pan. The uncooked mussels should smell of nothing. If they smell fishy then you've got a problem. Tips gleaned at this point included the top part of a chilli being hotter than the bottom, using a spoon to removed chilli seeds because they are bitter. Use both the leaves and stalks of coriander as more flavour in the stalks but leaves only of basil as the stalks are bitter. Finally time to eat some of the fruits of our labour. 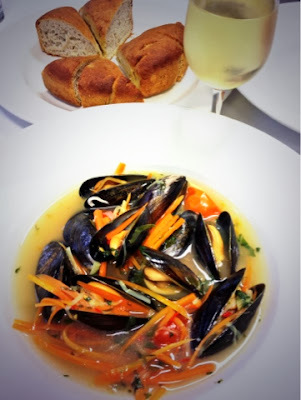 The spicy mussel broth did exactly what it said on the tin. It had a fantastic kick but the chilli didn't overpower all the other amazing flavours. A top tip from me. If you can, get public transport or organise a lift. Plenty of wine available to wash down your food. Alas I was only able to indulge in one glass on this occasion. Better planning required next time. 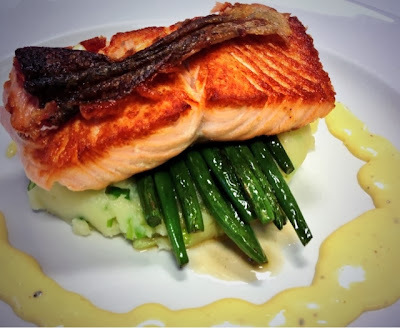 Loch Duart Salmon for main course alongside a foolproof hollandaise sauce. Despite doing what I was told and leaving the salmon to cook skin side down with no poking or prodding I managed to mess up my crispy salmon skin. The whole dish however did taste great. Even with my slightly dodgy presentation. Time to reheat our cakes and serve up desert. You would never guess that the secret ingredient in this spectacular looking dish is a jar of apple sauce. 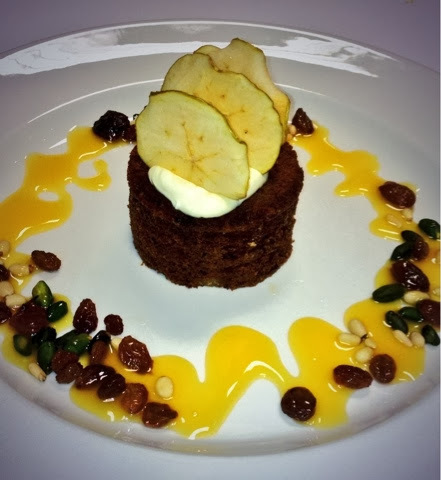 The cake was topped with creme fraiche and apple chips to give height, orange and passion fruit sauce drizzled round and a sprinkling of boozy sultanas and nuts. The first bite is indeed taken with the eye. Yet again I had a fantastic time at Cook School. This was my fifth class in Aberdeen and previous to that I'd been to a couple in Port of Monteith. The banter, demonstrations, hands on opportunities and food is second to none. I'd be hard pushed to think of a better gift to give a foodie for Christmas. The full range of gift cards is available online at Nick Nairn Cook School. Order by 18th December for Christmas delivery or if you've left it a wee bit late e-gift cards are immediately available 24/7. 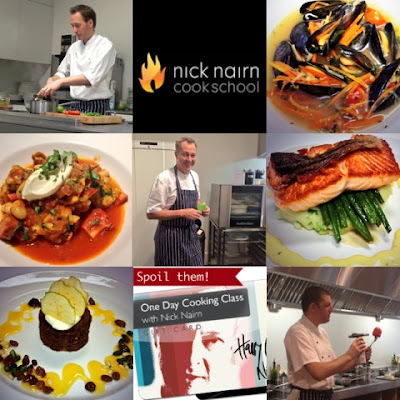 Thanks to Nick Nairn Cook School for giving me the One Day Giftcard and to my Mum & Dad for my Quick Cook Card. 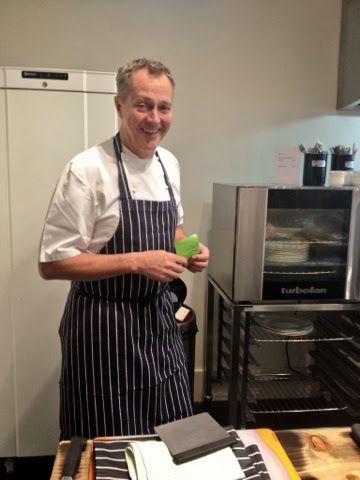 I've been to the Cook School at Port of Menteith a few times and it is truly a great day out. So much so my husband & his pal are going to the Italian day on the 21st Dec.